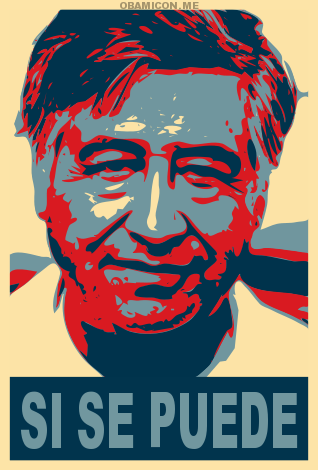 Cesar Chavez + Unity + Justice + Equality = Si Se Puede! As we celebrate Cesar Chavez Day, let us always remember his call for unity, equality, and justice for all Americans: Sí, se puede! 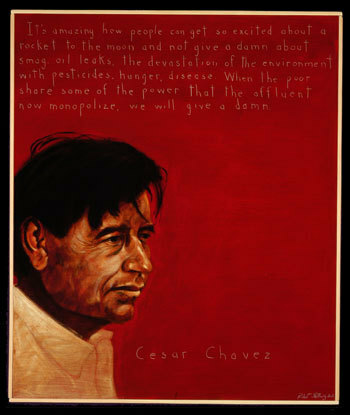 Cesar Chavez is one of the ultimate heroes for a lot of us … founder of the United Farm Workers, keeping the fires of justice alive even when it wasn’t popular or cool or politically correct. Say what you will about him, but he completely walked the talk and showed many of us how to do this without fear of the consequences, that it was always right to do the right thing, that a movement could start with one person. My parents both went back to school when we were little; this was right at the peak of the Chicano Rights Movement and the heyday of the grape and lettuce boycotts. Therefore, we were privileged enough to see a lot of the protests and store boycotts up close. I even remember our Dad driving the family car into a Safeway parking lot and then right out again to the cheers and shouts of the UFW supporters with their picket signs. As I got older, I remember going on marches, seeing Cesar Chavez and Dolores Huerta speak on a number of occasions and, quite frankly, started looking for ways to promote my heritage, that Latinos were real people, that we should be a part of the solution and not part of the problem. 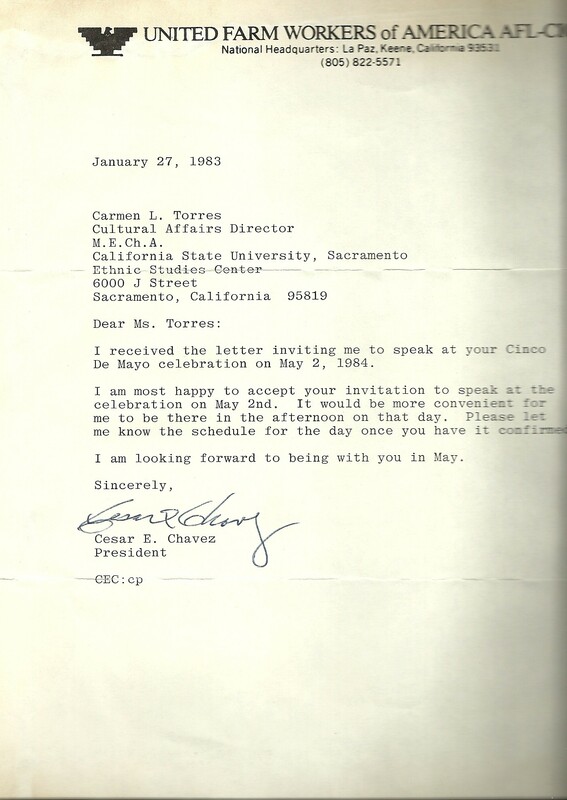 If someone like Cesar Chavez could do and DID it, then it must be ok for me to try and do the same. My roommate Lisa and I drove to 40 Acres on the day that he broke the fast and took communion for the first time in weeks. I remember that we were partying the night before and had no sleep but it was awesome to be present at that special Mass in Delano and I know that I came away inspired and motivated to continue to walk the talk as best as I could. 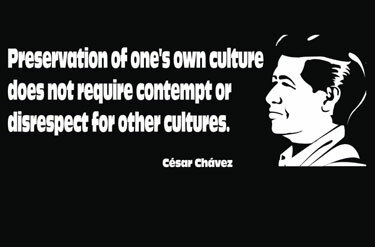 I often wonder what Cesar Chavez would think about the current anti-immigrant climate in the US, and how he would inspire, motivate and galvanize people to put the issue on the front page instead of the back burner. I hope that his spirit of justice will help us prevail in this complex and polarizing issue and to remind the world that it is important to take care of the people who work in the worst of conditions to harvest the food that reaches our table every day. 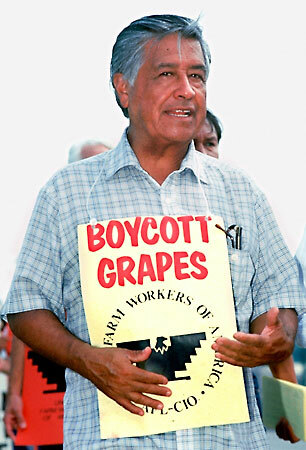 Also looking forward to the day that we celebrate Cesar Chavez as a nation … SI SE PUEDE! It’s hard to believe that it’s been 17 years that Selena left this earth on that fateful day … it’s totally one of those times where you remember exactly where you were when you heard the news…I was still on the air at KCVR in Northern California and on my way into the station when I heard on the car radio that Selena had been shot…my shift started at 11am and, shortly after that, it was confirmed that she had passed away. The rest of the afternoon was completely surreal … my listeners were beyond shocked and saddened. My program director made the decision to just let us open the microphones and let the listeners take over the show … so it was all about playing her music and letting the listeners talk and, many of them were really crying and crying. I kept it together all the way thru my airshift at 4pm. Once I got off of the air, all of the TV sets at the station were set to events unfolding in Corpus Christi and it started to hit me what had happened…I was asked to talk on-air awhile later about Selena and I couldn’t get thru it as I just started crying. 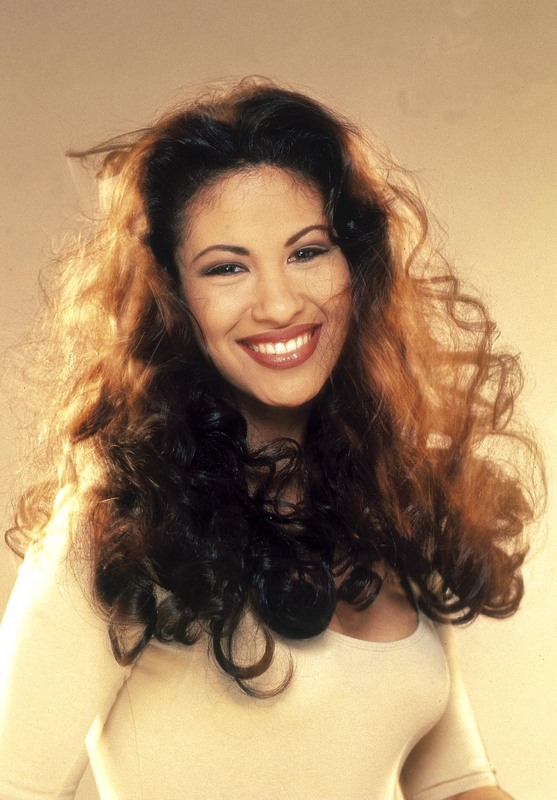 We all know that Selena hit a chord with so many people from throughout the U.S. because she looked like us, talked like us — that is, one of the first to talk in Spanglish before it was cool like many of us did as we were trying to learn proper Spanish! Selena was destined to be a major star … I often wonder if J Lo would even exist had Selena lived! If you ever watch any of her videos on You Tube which are interviews — that’s where you really see how crazy and funny she was … that’s where you can really see the Spanglish come alive that many of us completely embrace and understand! The music, of course, will live forever and I remember playing Selena all of the time when I was on-air … even more that I probably should have 🙂 Si Una Vez, Technocumbia, No Me Queda Mas, Ya Vez, Ven Conmigo, Bidi Bidi Bom Bom, Baila Esta Cumba, Que Creias, Como La Flor, Amor Prohibido, Yo Te Amo, Cobarde, I Could Fall In Love, Dreaming of You, Missing My Baby, Donde Quiera Que Estes and so many more! Fun Learning from DELMIRA and Las 3 Hermanas! 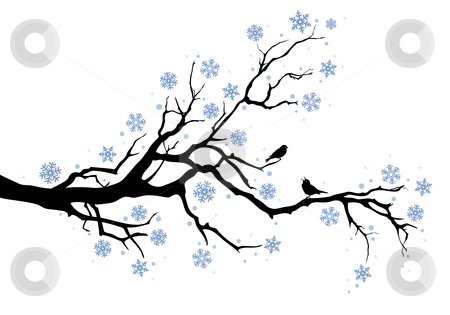 New friends can walk into your life when you least expect it … Delmira, and ‘Las 3 Hermanas’ Mila, Letty, Elvia and I got together supposedly to talk about writing and blogs … and the conversation turned into sharing of life experiences. Delmira, being a generation ahead of us, shared some fascinating stories about her life and about her take on the world she has lived in. You would think that we would have little in common…not the case! What was amazing to me (and to all of us I think) was that Delmira was indeed a trailblazer in her way of thinking — she was very much a modern woman back in the day, “luchadora”, there for her familia yet with her sense of self very much present and intact. I remember telling Delmira that she thought just like I do in 2012 at a time when it was more difficult to be an independent and outspoken woman — as many others were, including my Mom. Would I have had the ‘huevos’ or should I say ‘ovarios’ to do this in, say, the 50’s or 60’s like when, as Delmira says, tape was put over students’ mouth so that they wouldn’t speak Spanish… Quien sabe…who knows? I have such an amazing familia and a huge bunch of ‘famfriends’ that it’s easy to think sometimes that I don’t need any more … Loooooove it that these 4 awesome women allowed me to see that the more things change, the more they stay the same. I’ve always loved being around people and love it that four new ‘famfriends’ exist in my life … bienvenidas amigas! 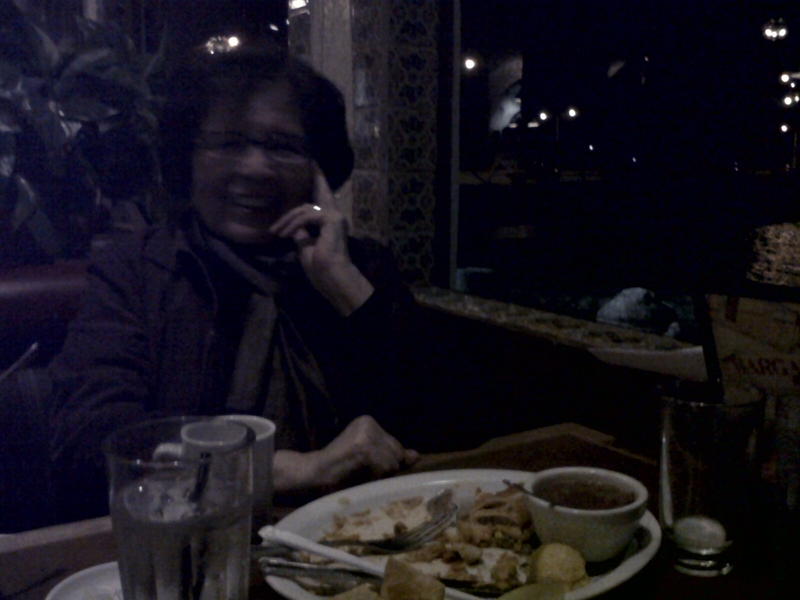 Next time we get together chicas, I promise to take the good camera so that the pics aren’t so dark! We have all grown up and threatened with all kinds of madness starting with El Cucuy and La Llorona … sure those two might have been out there in the dead of night but did you ever see them face-to face? 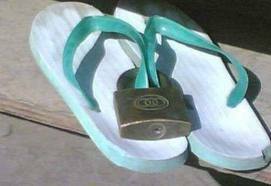 The one thing we have ALL seen at one time or another is “La Chancla”. Soft chanclas fit so comfortably in one’s hand so that the impact is immediate with little effort across the side of one’s head, bottom, or legs. The harder chanclas are the best for throwing across a room — duck fast or you can be hit by a flying chancla — then again, that was likely the intention, que no? 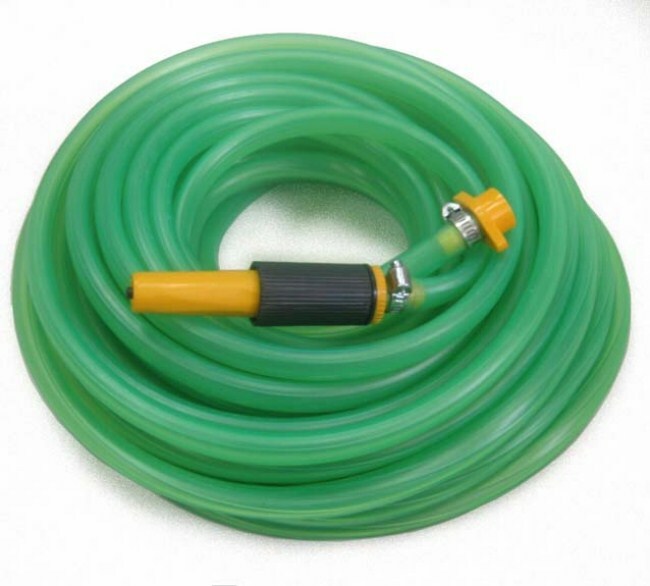 My Aunty Vina (RIP) used to tell my Grijalva cousins, “you want the shoe?” LOL and let’s not forget the mighty “manguera” water hose that was broken out from time to time! 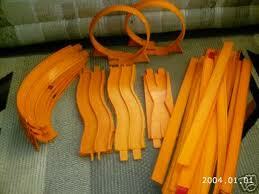 What about Hot Wheel Tracks? My Aunty Jenny (RIP) was a master at holding them in such a way that, once you saw the track, you settled down QUICK. And we will NEVER forget the time that she actually USED the Hot Wheel Track! If you didn’t put your head up right in the morning while your hair was being combed — and MANY of us had LONG hair which had to be braided or put into ponytails daily — you ran the risk of getting thumped on the head with the hairbrush! The belt? How many times did we hear “lemme get that belt” … and that was ALL we needed to hear to stop driving our parents crazy! I’ve heard of folks experiencing getting hit with spoons, celery stalks, “matamoscas” flyswatters, ironing board cords, you name it … and, as long as it was done in “fun” and not at an abuse level, war stories of what parents were willing to do to keep us in line can make for a fun time with more than smiles, but straight-up ‘carcajadas’/laughs! 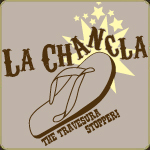 But the ultimate equalizer, to this day, for many of us, remains “La Chancla” … I mean how ‘rancho’ can you get?! And when you’re older and you remind your parents about the “chancla” – it’s usually veeery funny! 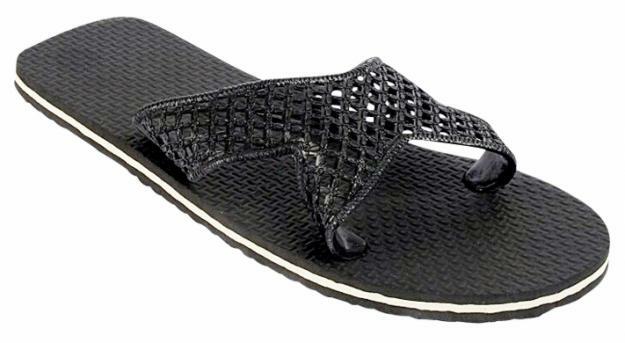 I have no children so my question for all of you parents who grew up “espantados”/afraid of certain types of footwear … do you now threaten your kids with “la chancla”? But, more than that, the mopping session yesterday felt like I was cleaning away negative vibes, and with every step, things felt very positive. 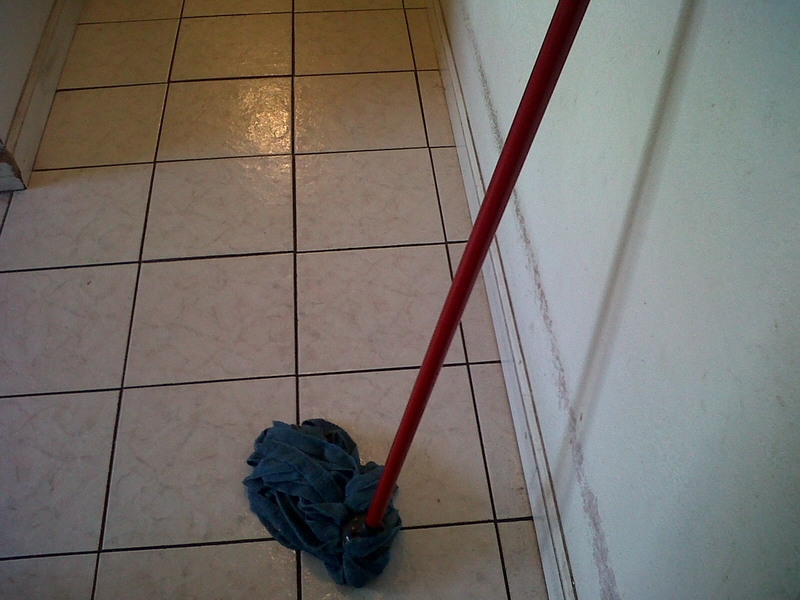 My parents were both in good spirits yesterday … could it be because the floor was clean and shiny? I’ll try to convince myself that, yes, it was because of me LOL! Seriously though, sometimes it’s good to get that mop out and scrub things clean in your life: both literally and figuratively. 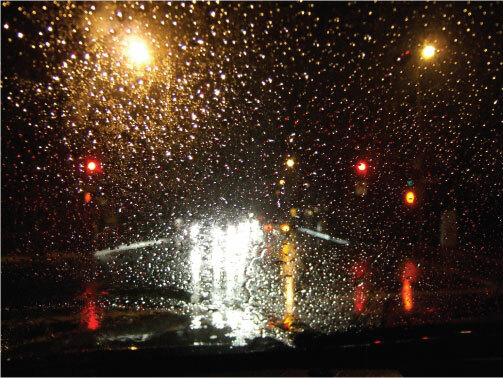 On Jan 6, 2006, on a Friday night, when it was raining, and I was tired from having driven all day from Los Angeles, and was on the way from the Ranch to Pleasanton, my new white Jeep got into a bad accident with a semi-truck on 205 in Tracy. Car was totaled and I ended up with two broken hands. I never really thought about flashback attacks until I started getting them … turns out that it was always on a Friday night and always between 7 and 9 at night. 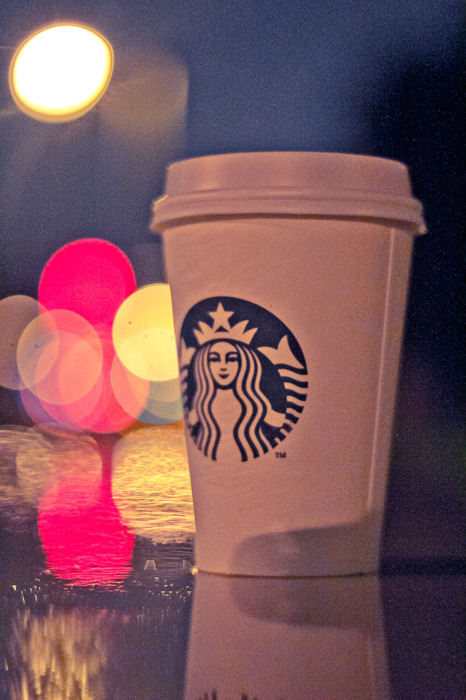 So here I sit, watching the rain, in one of my favorite places: Starbucks, no surprise here LOL. 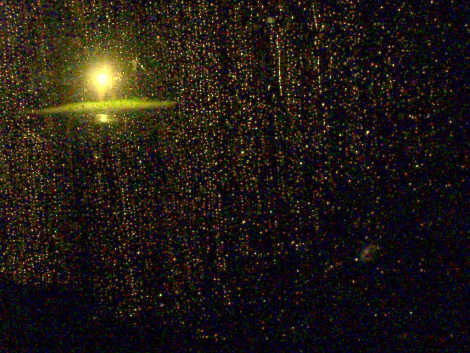 So instead of watching the rain thrash around as I did when I was driving in the pic above…I am now being calmed by the raindrops as they fall out of the huge window in front of me, watching people walk thru the rain with more smiles than stress on their faces…I’ll kick it here for a while more, listening to music, smelling cafe, writing, and calming myself down enough to eventually get back on the road toward my house and my comfortable “cama” bed!